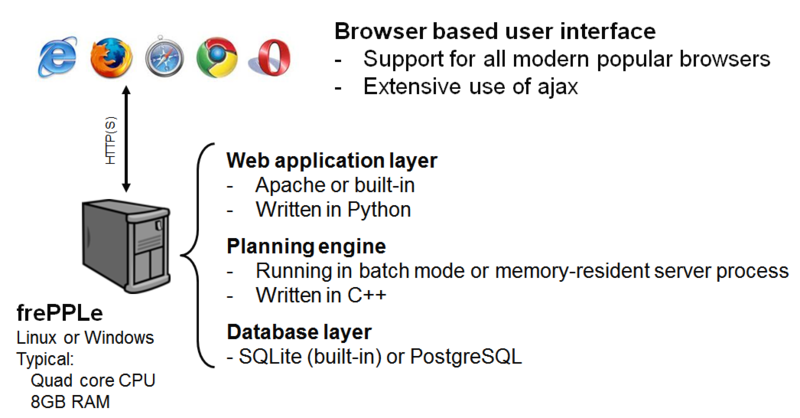 FrePPLe has a 3-tier architecture, typical for most web applications. The user interface is completely web browser based, using state of the art web techniologies such as HTML5 and ajax. FrePPLe supports most modern browsers: Google Chrome, Firefox, Safari, Internet Explorer(>=10) and Opera. The web server retrieves data from the database and serves the content as HTML pages to the user. FrePPLe supports the Apache web server, and also has a built-in Python-based web server. Long running tasks (such as the planning algorithm, database backup, scenario copying, …) don’t run in the web server process. Instead, the web server will spawn a separate worker process to execute these. The planning data are stored in a PostgreSQL relational database. The database schema is simple and stable, which makes is possible to integrate with external applications directly at the database level. A special use case is to use frePPle as a backend planning engine without user interface. In this case the planning engine can be embedded in another system. Users use the other system as the front-end, and frePPLe’s algorithms are used in the back-end to generate the plans.